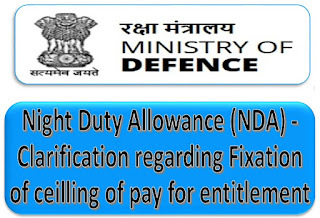 Government of India, Ministry of Defence, (Department of Defence), D(Civ.II)** Subject: Night Duty Allowance (NDA) — Clarification regarding Fixation of ceiling of pay for entitlement ** Ref: CGDA UO No. AT/II/2366/NDA/Vol-X dated 22.01.2016 and last reminder dated 13.12.2016 ** In compliance of Hon. CAT, Jodhpur Bench Order dated 5 Nov 2009, MOD issued letter dated 8th May 2015 to provide that the payment of Night Duty Allowance (NDA) shall be made on the basis of the current pay of the employees who are deployed for performing the duty during the night hours. 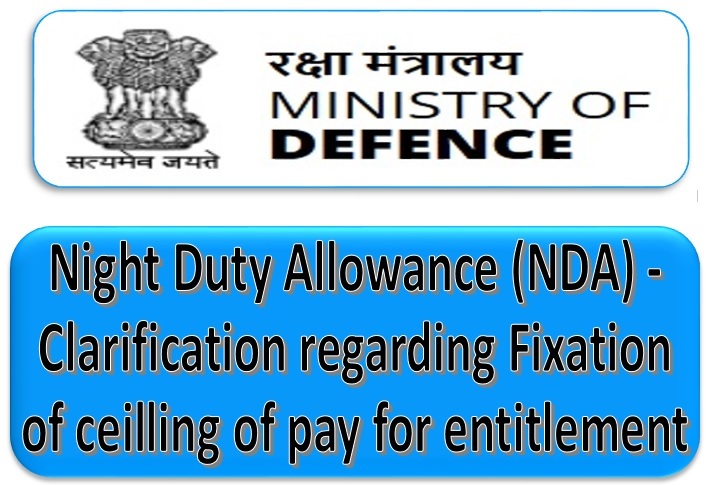 Subject: Night Duty Allowance (NDA) — Clarification regarding Fixation of ceiling of pay for entitlement. Ref: CGDA UO No. AT/II/2366/NDA/Vol-X dated 22.01.2016 and last reminder dated 13.12.2016. In compliance of Hon. 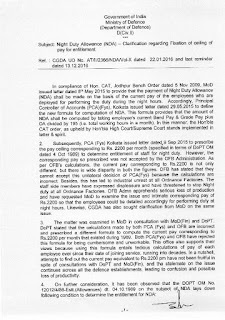 CAT, Jodhpur Bench Order dated 5 Nov 2009, MOD issued letter dated 8th May 2015 to provide that the payment of Night Duty Allowance (NDA) shall be made on the basis of the current pay of the employees who are deployed for performing the duty during the night hours. Accordingly, Principal Controller of Accounts (PCA)(Fys), Kolkata issued letter dated 29.05.2015 to define the new formula for computation of NDA. 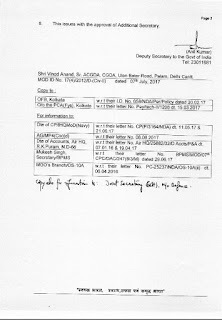 This formula provides that the amount of NDA shall be computed by taking employee’s current Band Pay & Grade Pay plus DA divided by 195 (i.e. total working hours in a month). In this manner, the Hon’ble CAT order, as upheld by Hon’ble High Court/Supreme Court stands implemented in letter & spirit. 2. Subsequently, PCA (FYS) Kolkata issued letter dated, 9 Sep 2015 to prescribe the pay ceiling corresponding to Rs. 2200 per month (specified in terms of DoPT OM dated 4 Oct 1989) to determine entitlement of staff for night duty. However, the corresponding pay so prescribed was not accepted by the OFB Administration. As per OFB’s calculations, the current pay corresponding to Rs.2200 is not only different, but there is wide disparity in both the figures. OFB has stated that they cannot accept this unilateral decision of PCA(Fys) because the calculations are incorrect. Besides, this has led to industrial unrest at all Ordnance Factories. The staff side members have expressed displeasure and have threatened to stop Night duty at all Ordnance Factories. OFB Admn apprehends serious loss of production and have requested MOD to examine the issue and intimate corresponding pay of Rs.2200 so that the employees could be detailed accordingly for performing duty at night hours. Likewise, CGDA has also sought clarification from MOD on the same issue. 3. The matter was examined in MOD in consultation with MoD(Fin) and DoPT. DoPT stated that the calculations made by both PCA (FYS) and OFB are incorrect and prescribed a different formula to compute the current pay corresponding to Rs.2200 per month that existed during 1989. Both PCA(Fys) and OFB have rejected this formula for being cumbersome and unworkable. This office also supports their views because using this formula entails tedious calculations of pay of each employee ever since their date of joining service, running into decades. In a nutshell, attempts to find out the current pay equivalent to Rs.2200 pm have not been fruitful in spite of consultations with DoPT and MoD(Fin), and the stalemate on the issue continues across all the defence establishments, leading to confusion and possible loss of productivity. (Clause a) – The ceiling of pay for entitlement of NDA shall be Rs. 2200/- p.m. The pay ceiling of Rs. 2200 per month mentioned in the DoPT in their OM dated 4 Oct 1989, was prescribed more than 25 years ago. During the intervening period, two Pay Commissions have come into force which have altered the pay structure of the employees drastically. In spite of an altogether different landscape of the pay structure, the DoPT did not come up with any revised order to amend the provisions of their OM dated 4 Oct 1989 relevant to the current pay structure. In the absence of clear guidelines, the management of Defence Establishments resorted to adhoc measures to keep their organizations running during the night hours in the intervening period. Proposals sent by MOD to DoP&T at various stages in the light of various judicial pronouncements, were rejected, sometimes on the grounds that the DoPT orders are not applicable to industrial employees. In the current phase, the efforts being made by the defence authorities to adhere to the prescribed pay limit have proved to be frustrating because of the practical difficulties being faced by both Accounting Authorities and the Defence Estts who, due to tedious and lengthy calculations, have not been able to reach a consensus to determine the level of staff who can be deployed for performing the night duty. In the current scenario where the pay ceiling of Rs.2200 pm. is obsolete and meaningless, and the DoPT have avoided prescribing a realistic ceiling that would be relevant to the current pay structure of the Government employees, it is left upon MOD to find a solution. Even though MOD proposes to take up the matter with DoPT again for prescribing a pay ceiling based on the current pay structure, it is however felt that the decision thereon shall have reflection over the future cases only and is not likely to resolve the current cases. 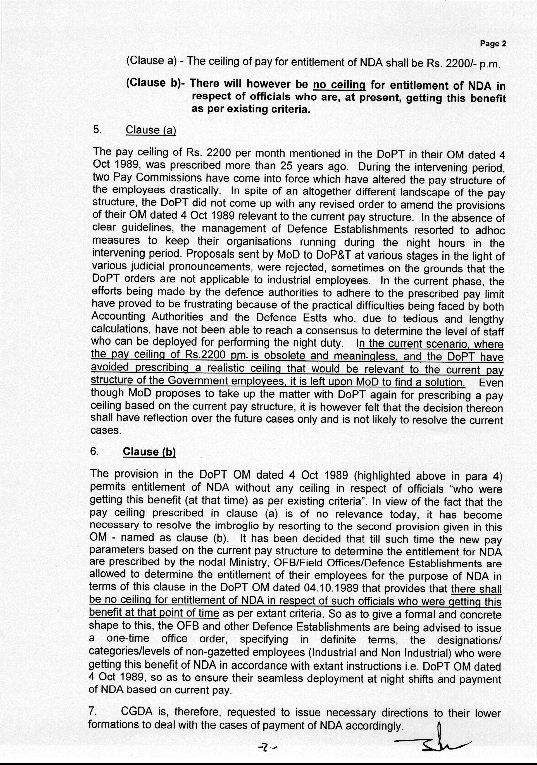 The provision in the DOPT OM dated 4 Oct 1989 (highlighted above in para 4) permits entitlement of NDA without any ceiling in respect of officials “who were getting this benefit (at that time) as per existing criteria”. In view of the fact that the pay ceiling prescribed in clause (a) is of no relevance today, it has become necessary to resolve the imbroglio by resorting to the second provision given in this OM – named as clause (b). 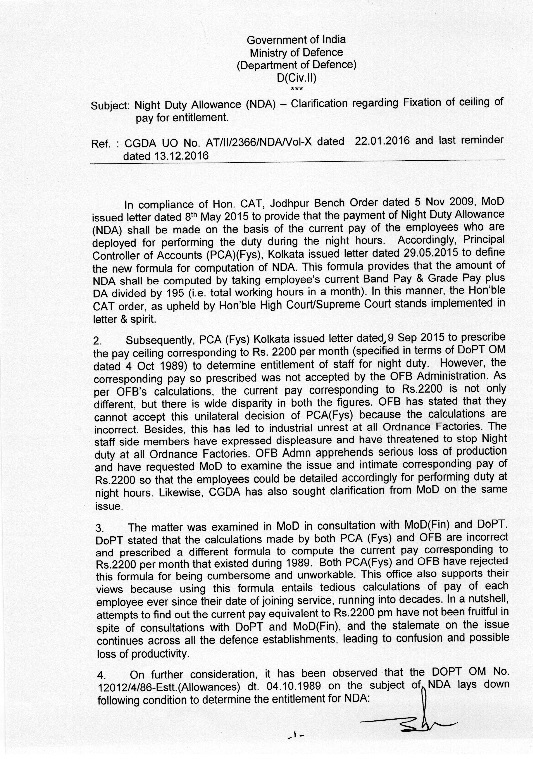 It has been decided that till such time the new pay parameters based on the current pay structure to determine the entitlement for NDA are prescribed by the nodal Ministry, OFB/Field Offices/Defence Establishments are allowed to determine the entitlement of their employees for the purpose of NDA in terms of this clause in the DoPT OM dated 04.10.1989 that provides that there shall be no ceiling for entitlement of NDA in respect of such officials who were getting this benefit at that point of time as per extant criteria. 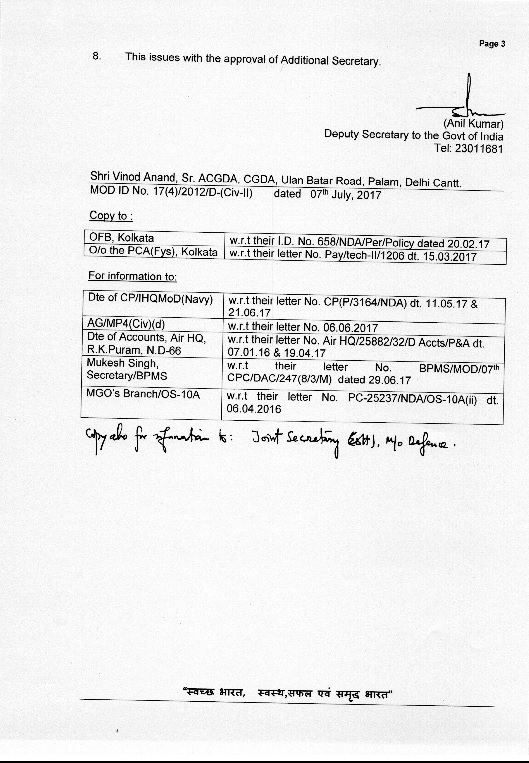 So as to give a formal and concrete shape to this, the OFB and other Defence Establishments are being advised to issue a one-time office order, specifying in definite terms, the designations/ categories/levels of non-gazetted employees (Industrial and Non Industrial) who were getting this benefit of NDA in accordance with extant instructions i.e. 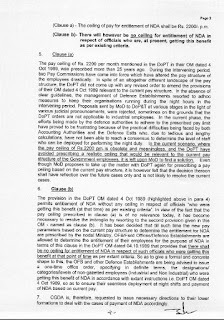 DoPT OM dated 4 Oct 1989, so as to ensure their seamless deployment at night shifts and payment of NDA based on current pay.